Here is another adventure in 5" squares. I love to use these because: so many patterns are available free of charge, someone else has already done some of the cutting, usually you are not ending up with pieces so incredibly small it takes forever to make a decent size quilt and our guild swaps 5" squares so we have squares with a theme. In July our guild swapped jewel tones. What is a jewel tone: turquoise, raspberry, garnet and gold just to name a few. Mostly tone on tone prints were turned in for the swap. These mixed well with not only my stash but also some earlier swaps. This block is great for a beginner because of the simple framing of the 5" square and the lack of corners to meet and match. The block is only the 5" square and the 2 shadow pieces added. Current measurements have this quilt at 55" x 78". The quilt required 2 strip sets. The first set is made of a 4" strip of the shadow fabric and a 1 1/2" strip of the background fabric. Cut the strip set into 1 1/2" strips. This is my end and not trimmed to 1 1/2" wide. The second strip set is made with 5" strip of the shadow fabric and a 1 1/2" strip of the background fabric. Cut the strip set into 1 1/2" strips. Place the background fabric of the strip set now measuring 5" on the top of the 5" themed square. Sew. Press toward the themed square. Place the shadow end of the strip set measuring 6" onto the shadow end of the partial block so the background fabric is diagonal from the other background piece. This is it for the blocks. It is time to figure out where you want your blocks. Place your blocks so the shadow is on the bottom right side of all your blocks. Utilize your design wall (mine was a floor but is often the backside of a vinyl tablecloth) to rearrange your squares that is pleasing to the eye. I found myself walking around the quilt so the shadow was in the appropriate place while doing this. I chuckled at myself after walking around the quilt more than once and standing in the exact same place every time. My quilt sashing is 3" wide. This is the approximate size that the squares were placed apart when rearranging for color. You decide what your quilt blocks need. To have the ratio mine is cut 3" x 6" background to go between each block in a row. Sew the rows together. Then, cut 3" strip long enough to span the length of the row. Sew strip between each row. Please leave me ideas for borders in the comments! The 5" blocks, well, there are just a handful left in the sew room. 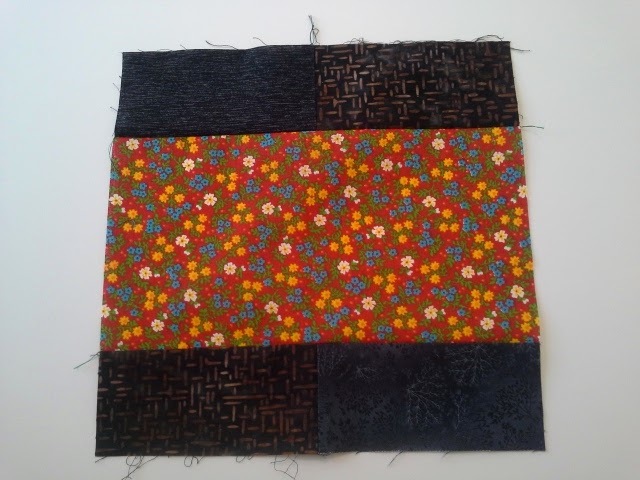 Added to the swap blocks were 4 fabrics from fat quarters, the leftover is only 16"x 18". Another similar background is available and won't show if switched for the borders. A few buddies think they may have some of the original. Background fabric estimated yardage: 2 2/3 yds. Cut 9- 3" strips on the length wise grain. Cut them to at least 56" (Remember body of quilt 55"x78"). Cut the remainder of the 3" strip down to the 3" x 6" (need 70). Cut another 3" strip. Cut up for the rest of the 70-3" x 6" strips and then cut in half lengthwise for the 1 1/2" strip background for the strip sets. There should be enough fabric left for a border around the body of the quilt. These straight grain (lengthwise) pieces are more stable when left in these long sections for sashing or inner borders. If you make a strip set WOF for the 2 strip sets you will get 26 maybe 27 of the 1 1/2" cuts. That means 3 strip sets with some leftovers for the 70 blocks in this quilt. The original inspiration is from Judy Martin-Newport Beach and Robert Kaufman-Shadow Box Now….so many patterns are out there for these 3-D type quilts. Use the fabrics you have. Buy what you need. Some of the patterns used fairly light shadows. The continuity of the shadow is more important than how dark the pattern is. The consistent part for the patterns is the shadow seems to work best if 1 1/2” wide. Enjoy and use that stash! These are some of the pictures from 2 years ago. If you have the opportunity to come out we would love to see you. There is a $3 admission and luncheon by donation. 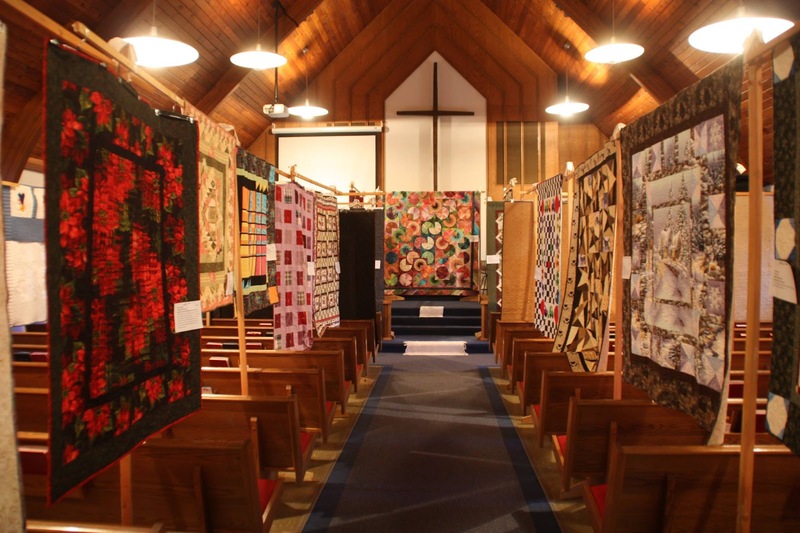 Come see what the Upper Rock Island quilting community has to offer. Both new and historical quilts present. 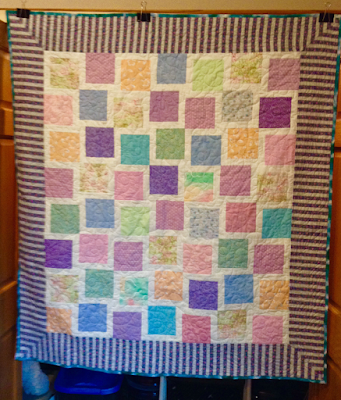 We are still looking for quilts from the surrounding area. Forms need to be filled out and returned by August 29th. Forms are available at the church. This quilt was made with a 5 inch squares. The squares have 1 1/2 inch strips on two side. They are rotated back and forth to give a great presentation.The strips are 1 1/2" x 5" and 1 1/2" by 6". I just cut a 1 1/2" inch strip and sewed the 5" squares along one side of the strip and cut them apart. Then I turned all the squares the same direction and sewed the second side of the square onto the one and a half inch strip. The new square measures 6". The layout I used is from Bonnie Hunter's dancing nine patches. Bonnie's nine patches measured 5 inches. This made it easy to convert over to a solid square. I have been helping with the 5" square fabric exchange for 1 year now. I enjoy finding places to use these fabrics. The guild had an Irish Chain block using Christmas prints. 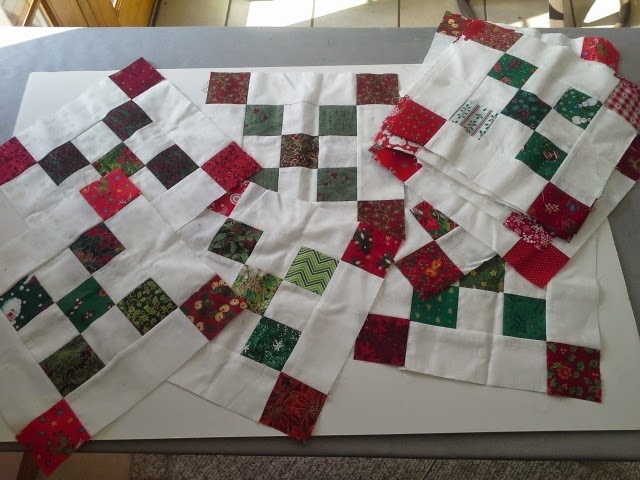 The 5" Christmas exchange squares were easily cut to accommodate the 2 1/2" squares called for in the rabble block pattern. The best part.....I won a great stack of blocks. These blocks will be used for the Christmas Traditions quilt to be auctioned off in December. 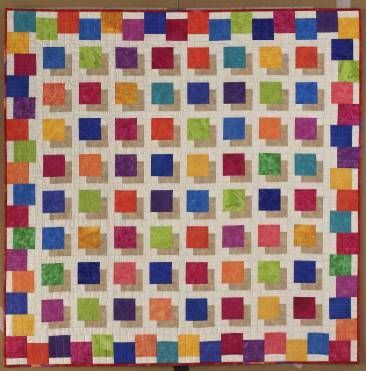 The latest finish is a quick option for using your 5" squares as a type of sashing. This pattern works great with fat quarter bundles or a little yardage. The novelty prints are great because the larger pieces allow print patterns to still be distinguishable. 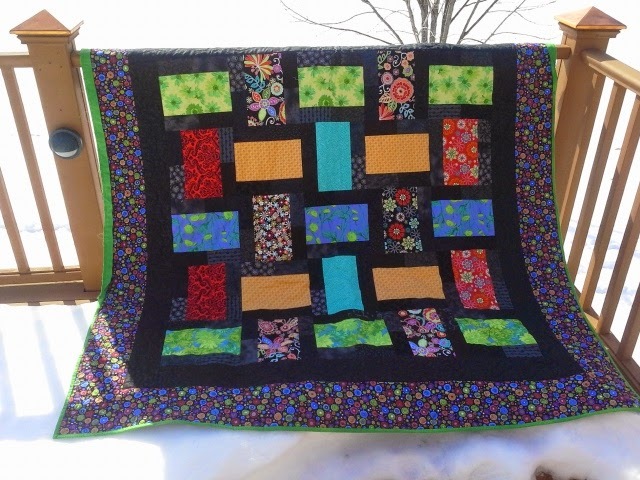 This quilt is using the 5" black square fabric exchange. Some of my swap fabrics were lighter than I wanted for this quilt so some fabrics from my stash were cut into 5" squares and substituted into the quilt. Occasionally a 2 1/2" black strip was paired up and sewn to make the block. Use what you have and cut only what needs to be cut. Using the pre-cut pieces first is what turns this quilt into the quick project. Here you can see where 2 black squares are layered right sides together and sewn on 1 side. The unit is cut in half across the seam yielding 2 pieces. Press the pieces. It doesn't matter how you press here....none of these seams match up with anything....no bulk no matter what you do! 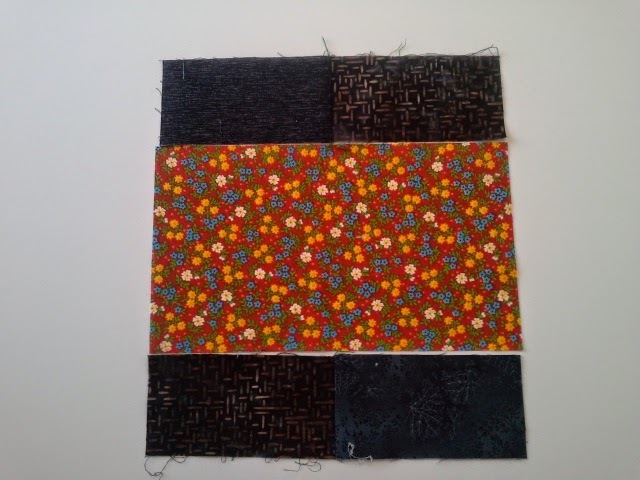 To make this block square....cut a 5 1/2" x 9 1/2" rectangle out of your novelty fabrics. My stash included some older sample card fabrics. 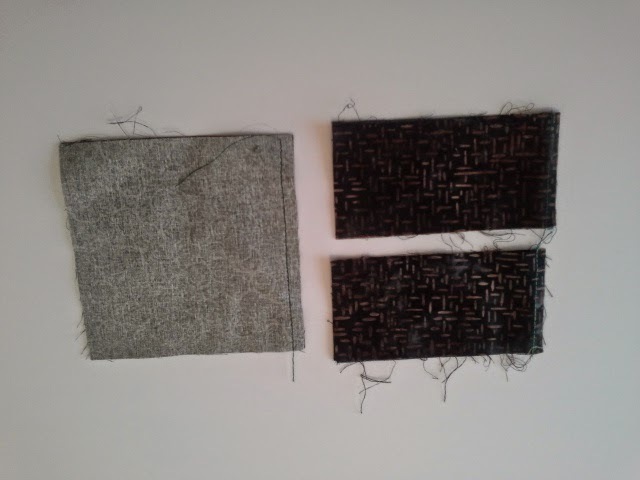 These sample pieces were from the same fabric lines but the focal pieces were larger, the accent pieces were small. The card was carried by the salesman to shops showing current selections. These had some memories for me and I seemed to by keeping them not sure of how to make a great quilt out of such little pieces. The largest piece couldn't have been more that 14' x 18". If these larger prints were cut too small the great patterns were lost. Pair up the 5 1/2" x 9 1/2" novelty print with a pair of black 2 1/2" x 9 1/2" pieces. Sew. Lay out the blocks alternating the black strips vertical and horizontal. Sew the rows and columns together. 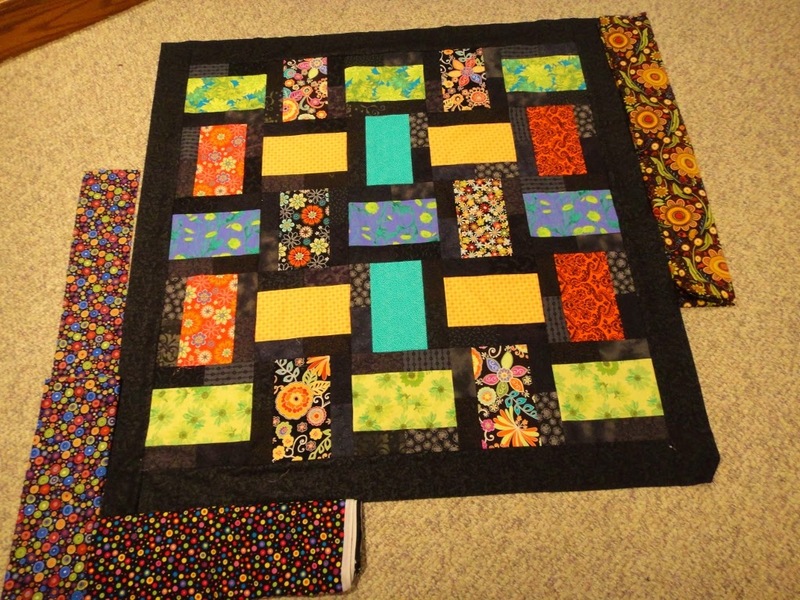 A 3" scrappy black border frames the body of the quilt. The hardest part of this quilt was organizing the squares. The variety was just a jumbled up mess when pieces were random. The contrast between the tone on tone fabrics had your eye jumping everywhere. The pretty prints...well that's all there was. What you can't see...some of the print backgrounds are brown, some are black. Also 2 of the flower prints only occur once. The bright fun print on the left cut to my favorite 6" border finishes the quilt. The lime green binding can be seen in the top photo really brings it all together. Many other options were auditioned...the lime green made the quilt. I was hoping to use that fabric somewhere else, but.....use what you have, but what you need. I guess a shopping trip will be in order when lime green is "needed". You can check out what others are doing at Freemotion by the River.